With Halloween over, we are rapidly heading towards winter although recent temperatures would make you think otherwise. I recently bought some Stampin Up! Smokey Slate card and ink and wanted to make a simple card with them. Forgive the terrible photo (my camera needs to see a doctor) but hopefully you will get the idea. I have matted two pieces of Smokey Slate card with one piece of Whisper White as the sandwich filling, all sponged with in grey. Then using Versamark and the Bordering Blooms photopolymer stamp set, I stamped first the longer image and heat embossed it in white, then the shorter image, heat embossing that in silver. I toyed with the idea of adding some basic rhinestones, but ultimately decided it didn’t need them. 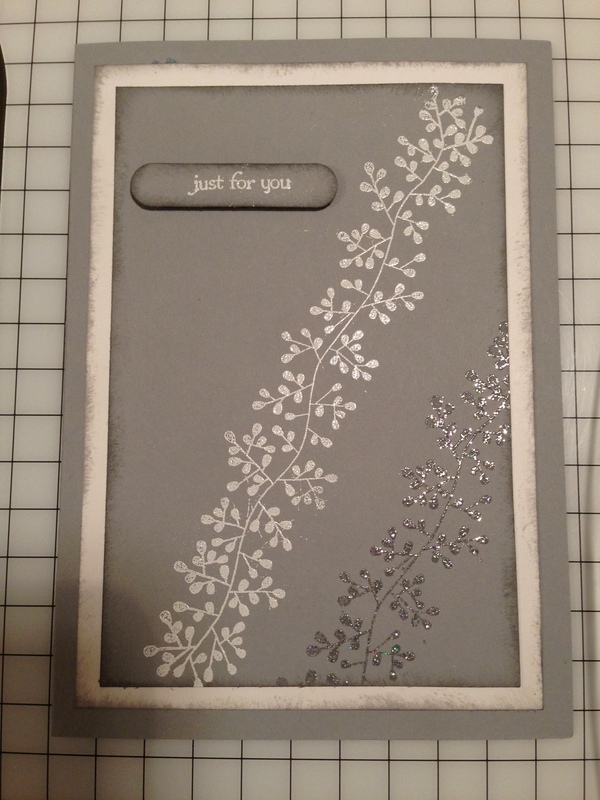 To finish I stamped a sentiment and heat embossed that in white. If you have any questions, or would like any of the items use to make this card, please do not hesitate to get in touch (or use the SHOP) button on the right.